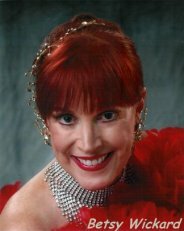 Betsy Wickard, formerly with The Palm Springs Follies, The Branson Follies, and Golden Girls USA presents three one-woman musical revues. There are songs you’ll remember, dances you won’t forget, and music you’ve always loved. Remember When ~ a nostalgic tribute to Fred & Ginger, Sally Rand, Eddie Cantor, Al Jolson, and the veterans of our Armed Forces. The USO Show ~ a rum-tumming flag-waving salute to the veterans of our Armed Forces. The Christmas Show ~ a Holly Jolly Christmas celebration with Rudolph, Mrs. Santa, and The Little Drummer Boy.